Amid a massive humanitarian operation, aid agencies had hoped that a cease-fire agreed in May would allow some populations to return and sow crops before the rainy season begins in earnest, thereby reducing the likelihood of a famine in the months to come. But tension remains high, and interviews with internally displaced persons (IDPs) near the northern town of Malakal as well as in the capital, Juba, suggest slow-moving peace talks held in neighbouring Ethiopia must yield concrete results before civilians will consider returning home en masse. Civilians abandoned Malakal and many other towns after a power struggle within the ruling Sudan People’s Liberation Movement (SPLM) boiled over into vicious fighting that began in Juba in December and swept across the north and east country. The conflict has split the army and pitted loyalists of President Salva Kiir against supporters of his former deputy, Riek Machar. Government troops as well as opposition fighters have been accused of massacring civilians on the basis of their ethnicity. Kiir is an ethnic Dinka, while Machar is a Nuer. Thousands of people have been killed and an estimated 1.5 million driven from their homes, crippling government services and economic activity in much of the world’s youngest nation. Some four million people are in urgent need of humanitarian assistance. While about 400,000 people have crossed into neighbouring countries Ethiopia, Sudan, Uganda and Kenya, an estimated one million are displaced within South Sudan. That includes some 90,000 sheltering in the bases of the UN peacekeeping mission, UNMISS, which are now known as Protection of Civilian (PoC) sites. Chol is one of 18,000 civilians squeezed into the PoC site in Malakal, where UN officials and relief organizations are striving to improve the dire living conditions. Makeshift shelters made of sticks and plastic sheeting are packed together either side of a single main access road. Drainage is so poor that many of the shacks stand in water and mud that in places rises above the knee, even before the rains begin in earnest. Children play along the road among garbage and razor wire, as trucks carrying earth from the site of a planned new camp edge past the tight rows of tea shops and food stalls. Flies buzz around dead dogs and cats, and smell of human waste is ever-present. 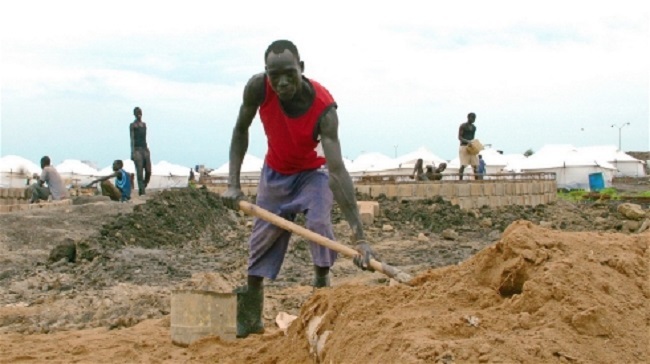 On the southern flank of the base, which lies a few miles (kilometres) north of the town, earthmovers were levelling a huge area to which most of the IDPs will be shifted in the coming months. IDPs have begun moving into scores of clean white tents erected on the first section. Relief organizations have built water points and latrines. Indian UN troops guard the perimeter, which is lined with earthen berms and razor wire. Nyamet Nyibong, a grandmother who said she saw a nephew and a sister killed in the fighting, said the new facility was a big improvement. “People were getting sick, sleeping on the wet ground. Here there is space, some wind and I can breathe,” she told IRIN, sitting on a low stool outside the new tent she shares with two sisters-in-law and other relatives. But she said she was frustrated by her forced inactivity. The difficulties at the base have persuaded some survivors to seek refuge elsewhere. Across the nearby White Nile River, an estimated 60,000 people have descended upon the fishing hamlet of Wau Shilluk. Shanty-like settlements have spread along the banks of the broad river. A field behind has turned into a vast open defecation site. Thomas Amun, a 33-year-old shopkeeper, said two of his relatives were shot for failing to hand over money and phones to opposition fighters who stormed Malakal in December. Amun and his family were among thousands who sought refuge at Malakal teaching hospital. “Gunmen came looking for their enemies there. They were executing people at random,” he said. When government troops re-took the town, which has changed hands repeatedly, Amun brought his family by boat to Wau Shilluk, rather than head for the PoC site. Friends loaned him a cow, and he sold its meat to raise the money to re-open his shop. Amum said he was earning enough to keep his family fed. He was unsure he would ever return to Malakal. “I saw a lot of things there that were very bad for me. Until I can get it out of my mind, I don’t want to go back,” he told IRIN. Malakal had been an important regional centre before the latest fighting broke out. The capital of Upper Nile State, it was home to many government offices. It was an important hub for traders bringing goods along the White Nile or from nearby Sudan. When an IRIN reporter toured the town, the streets were largely deserted. A few small shops served tea and snacks to soldiers and a handful of civil servants ordered back to work. Some of those living at the UNMISS base were checking on their homes – or those of their neighbours – for anything that hadn’t already been looted. Many of the houses and shops had been burned to the ground. The most visible human presence was a group of 26 families who had arrived three days earlier on foot and taken up residence in a ransacked mission school. In the school yard, children played among piles of scattered textbooks. The charred wrecks of five cars stood in an adjoining compound. Peter Bol, a 34-year-old farmer, said rebels driven back from Malakal had been preying on his and neighbouring Dinka villages in Panyikang County. Having lost his stocks of maize and sorghum and his 30 cattle, Bol said he led the group to Malakal in hope of finding assistance. He said government troops advised them against going to the base because of the grim conditions there. Still, UNMISS bases remain a magnet for scared civilians in a string of other towns, including Juba. A semblance of normality has returned to the capital, where four-wheel drive vehicles clog the dusty streets. However, several residential districts remain emptied of their ethnic Nuer population. Thousands of the missing are crowded into a section of the UN compound beside the airport, while others have skipped the country. Many wealthier citizens of all ethnicities have evacuated their children to neighbouring countries. In early June, an IRIN reporter watched as IDPs from the UN compound loaded suitcases and boxes bound with string onto two minibuses that would take them to Kakuma, a refugee camp just over the Kenyan border. Mary Nyaluak, 48, said she already spent five years in Kakuma during the civil war in Sudan that ultimately led to the south gaining independence in 2011. She said 23 of her relatives had been killed in Juba in December, some of them beheaded. Surviving family members were already in Kakuma, she said. International pressure for South Sudan’s leaders to end the war have been fronted by the regional grouping IGAD. Under its aegis, Kiir and Machar signed a ceasefire agreement on May 9, and promised “bold decisions” to bring peace and reconciliation, including the formation of an interim government of national unity. However, fighting has continued in several locations and there has been little tangible political progress. It is unclear exactly when IGAD plans for the deployment of a regional Protection and Deterrent Force, mandated to protect IGAD military observers, will be realized. “There has been a growing tendency to continue with the war,” Ethiopian Prime Minister Hailemariam Desalegn complained at a regional summit attended by Kiir and Machar in Addis Ababa on June 10. Relief officials are not banking on any easing of the pressure on civilians any time soon.